A brand new year and with it the next Wii U game to make the leap over to Nintendo Switch – or in this case two games. 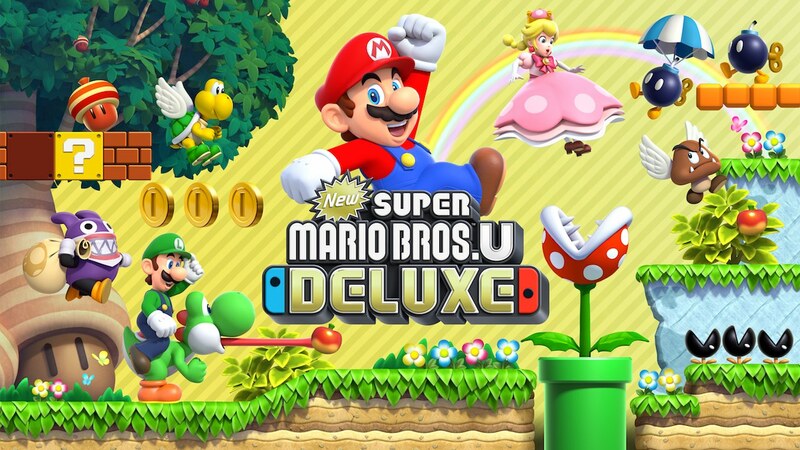 New Super Mario Bros. U Deluxe – besides being a complete mouthful to say – bundles both the Wii U launch title and its downloadable expansion with a sprinkling of small changes and new additions. Nintendo’s persistence to dip back into its Wii U catalogue has proven fruitful so far but how do Mario’s 2D adventures fare for a repeat visit? As far as Mario games go, New Super Mario Bros. U sticks pretty close to the formula set out by past games in the series. You’re still making your way through a sequence of worlds each housing a bunch of small linear stages, grabbing power-ups to help you and all this eventually leading to a final battle with Bowser himself. Deserts, snowy peaks, dense forests and castles – every location you’ve likely already seen before is here. Likewise, your arsenal of power-ups includes the well-known mushrooms, stars and fire flowers with one newer ability, the squirrel suit. Even boss battles follow the same ‘bonk them on their head three times’ rule that’s long been ingrained in our gaming minds for years. This is 2D Mario game through and through. It has to be said though, the wealth of ideas implemented throughout is impressive with every level playing host to its own unique playground of obstacles and nightmares to traverse. One moment you’ll be dashing across rolling logs and the next using luminous baby Yoshis to light your way through the dark underground. And of course, you can expect the same high level of control and handling the series has always been known for. One bothersome change though has seen the mid-air spin assigned to the jump button resulting in a number of accidental uses. It’s not game breaking but an option to alter the button layout would have been appreciated. As predictable as New Super Mario Bros. U can sometimes feel, overall I had a great time playing through even after beating it back on the Wii U. So what of the adventure featuring Mario’s younger sibling? On first glimpse, New Super Luigi U might seem like just another batch of levels to play through, but in fact, it features some of the bigger changes the ‘New’ series has ever seen. For starters take Luigi who controls far differently this time around. His lack of traction leaves you sliding to an eventual stop while jumps are higher and have a real float to them (much like his Super Mario Bros. 2 days). Taming Luigi’s movement here is far more challenging a task made all the more tougher given the expansion’s increased difficulty. In fact not only are stages far harder to negotiate than in Super Mario Bros. U but only allow you 100 seconds to finish them. The shorter, snappier stages result in a faster flowing adventure overall and one where you feel constantly pressured to move forwards. It’s a refreshing change for a series that four games deep certainly needed it. Much like Donkey Kong Country: Tropical Freeze, the changes made to the Switch version here clearly aim to make the game more accessible for newer players. Toadette (and Peachette) is perhaps the most notable and only real addition to the game sporting unique abilities over the rest of the crew in an effort to make things easier. She swims far better, can float longer and even grab 3-up moons instead of a regular 1-Up Mushroom. Likewise, Nabbit can now be played in both games (as opposed to just New Super Luigi U before) but just like Toadette he’s there to help less experienced players. The game even labels him as ‘Very Easy’. As a gateway for newcomers to the series these characters work as intended – my less experienced family members, for instance, able to hop in and have a better less death filled time. One problem we also ran into though occurred when there were four skilled players in the room. If you’re tackling either of the main adventures then there won’t be enough standard characters to go around. This essentially forces some of the group to play as the easier Toadette or Nabbit. It’s a silly oversight resulting in not everyone having the same challenging experience and considering the original games didn’t have this issue (since you could also play as blue Toad or a Mii) it’s a real nuisance. As someone who has played both games before, realising how little new content has been included is disappointing. It’s not necessarily a case of wanting something big like new levels or modes though. For example, a lack of online leaderboards feels like a huge missed opportunity what with the 2D Mario games ideal for speed running. Something like this would have also added incentive to go back and replay levels. As it stands though what we have is a faithful port of the original two games and little more. Outside the two main campaigns, lone players can also tackle challenge mode, an assortment of varied and often fun objectives including everything from speed-running a level to collecting coins in a set time to accumulating as many lives as you can by bouncing off of enemies. There are a generous number of bite-sized tasks to work your way through, the difficulty ramping up relatively quick especially if you’re shooting for gold medal performances. The reason I love this mode so much is that it takes all the skills you’ve learned from the main adventures and forces you to use them in some truly creative and demanding ways. Boost Rush offers another neat twist, ramping up the scrolling speed of a constantly forward-moving screen, the more coins you gather. Here it’s all about getting to the flagpole as quick as you can. Lose a life though and the screen will slow back down. Coin Battle meanwhile allows you to pick any unlocked level and compete for the most coins against up to three other players. It’s absolute chaos especially with your rivals trying to screw you over every chance they get but good fun nonetheless. It’s just a shame you can’t play any of the New Super Luigi U levels this way. If there’s one area that has continued to underwhelm when it comes to the New Super Mario Bros. sub-series it’s the presentation. The soundtrack is upbeat and catchy but far from reaching the high standards the series has set in the past. The visual style too while certainly colourful and crisp – whether you’re playing docked or in handheld – feels fairly bland especially when compared with other 2D adventures such as the beautiful Rayman Legends or Hollow Knight. What’s particularly baffling though are the one or two levels featuring visuals clearly inspired by Vincent van Gogh’s The Starry Night. It’s a distinct look and I just wish there were more examples like it to be found.